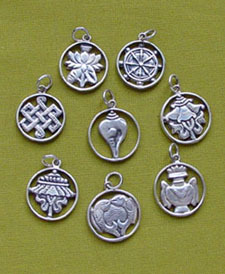 Tibetan and Nepalese Style Pendants! Silver, brass, copper and pewter pendants are shown below. Please ask if you are unclear about the metals. Malas, are found at the bottom of the Himalayan Cultural Crafts section. Large Lapis Brass Pendant, about 8.5cm top to bottom, 6.5 widest part. There are more of these in different shapes and slightly different sizes. Please ask for a scan. Similar Pendants are available, ask for a scan. White Metal, Brass or Copper. Prayer Wheel Pendant, paper scroll inside. Deer in Oval Pendant, 9 cm bail to bottom. P-617, about 2.7 cm from the top of the bail to the bottom. Brings Wealth to all women of virtue. They are hinged and will open. These come in brass and white metal with various stones. P-124, 3. 5 cm. This will open. approximately 2.3 cm from top to bottom. re-order but they may arrive with variations. Please ask for a current list of available unique pendants.